If you’re a patient that’s suffered tooth damage or tooth loss, you understand the consequences. Missing or damaged teeth are not only unattractive and unsightly, but can have a negative impact on your other teeth, your bite, and your jaw. It can be difficult to speak normally and enjoy your favorite foods as you did before. Your confidence and self-esteem will reflect your incomplete or damaged smile. Your mouth is a complex system, and when one part becomes compromised or goes missing, the whole system will eventually break down and fail. That’s why restorative dentistry is so important. It’s not just about aesthetics – it’s about your health and your quality of life. That’s why we’re proud to offer durable and natural looking restorations that look, feel, and function just like your natural teeth. Need a cavity filled? Thankfully, with advances in modern techniques and materials, we can now fill cavities with a more durable and natural looking tooth colored resin. Tooth-colored fillings are safer than metal fillings that use toxic mercury and blend in seamlessly with your natural teeth. If you have a large cavity that cannot be treated with a simple filling, you may require an inlay or onlay. This is a more extensive restoration that can treat and prevent further tooth decay. Less extensive than a crown inlays repair damage within the cusp, and onlays extend and repair beyond the cusp. If you have a tooth that has been damaged by decay or injury that requires more than a simple filling, inlay or onlay, or have a tooth that’s gone missing, you may need a dental crown. Made out of tooth-colored porcelain, a crown can restore your tooth in form and function. Are you missing a tooth or multiple teeth? You may need a dental bridge. Bridges consist of one or more fabricated teeth to fill the gap, and are attached with crowns on either side. Bridges redistribute bite forces and allow your mouth to function normally again. If you are a patient who’s lost most or all of your natural teeth, we want you to know that you’re not alone, and we can fit you with beautiful, secure, and life-like dentures to restore your smile and your confidence. No one will be able to tell the difference – not even you! 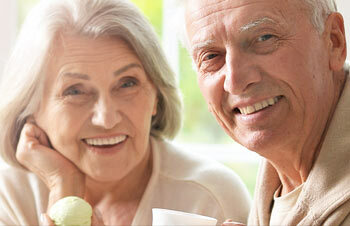 Dental implants are the #1 recommended tooth replacement solution – by doctors and patients alike. Implants replace the root of the tooth, providing the support your jaw and mouth need to function normally. 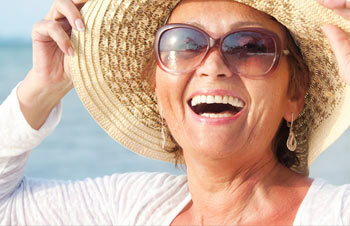 Implants can replace a single tooth or a full arch. If your smile has been devastated by disease, decay, or injury, the best decision you can make is allowing our doctors to help you. We have the skills, knowledge, compassion, and technology to help you get your smile, your confidence, and your life back. Are you ready to restore your smile and get back what’s been lost? You’re in good hands with our team. If you have any questions about restorative dentistry, or would like to schedule an appointment with your dentist, give us a call today! *Full mouth reconstructions available at our Oelwein office location only.